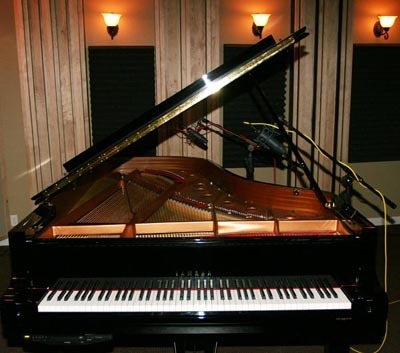 All the benefit of the definitive 7 1/2 foot acoustic grand piano of choice for studio recording plus the flexibility of MIDI I/O. Capture every note and every nuance of your performance, tweak the mistakes in MIDI, and record it again "fixed and scrubbed". Re-record a super clean "no bleed" piano track to build new vocals or instrumentals on top of. Route your piano MIDI performance to layer a string or synth patch on top of the phenomenal acoustic piano sound of the DC7. Route your piano MIDI performance to an Ivory Fazioli, Bosendorfer, or Steinway sample. Bridging the gap between fantastic acoustic piano and the vast flexibility of MIDI opens a whole world of options. What can you do with it?